Another “prototype” that’s a production car in all but name, the 2019 Acura RDX Prototype has been revealed at the 2018 North American International Auto Show in Detroit. Designed, developed and manufactured in America, it will be launching in the US in mid-2018. 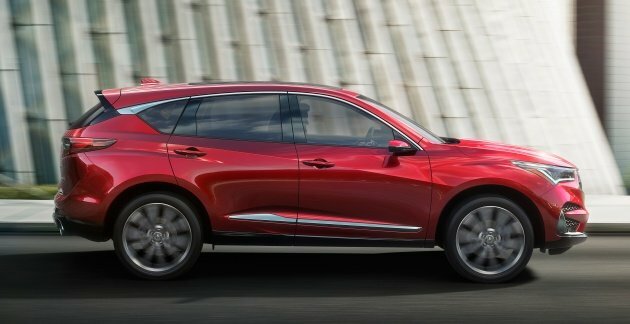 The current RDX is far from broke – Acura says that the outgoing five-seater SUV has chalked up five consecutive years of record sales and seven straight years of year-over-year sales growth (2009 to 2016) – but that has not stopped Honda’s premium brand from giving the RDX a clean sheet remake. It will be the first model to fully embody Acura’s new design language as envisioned in the 2016 Acura Precision Concept, and its new interior design and technology as imagined in the Acura Precision Cockpit. The third-generation RDX sits on a new, Acura-exclusive platform featuring a lighter and “dramatically stiffened” body, a new chassis and an all-new powertrain. The latter combines a new 2.0 litre VTEC Turbo engine mated to a segment-first 10-speed automatic transmission. The engine has DOHC, a low-inertia mono-scroll turbo and Dual Variable Timing Cam. Acura says that it delivers 40% more low-end torque than the outgoing car. No output figures yet. 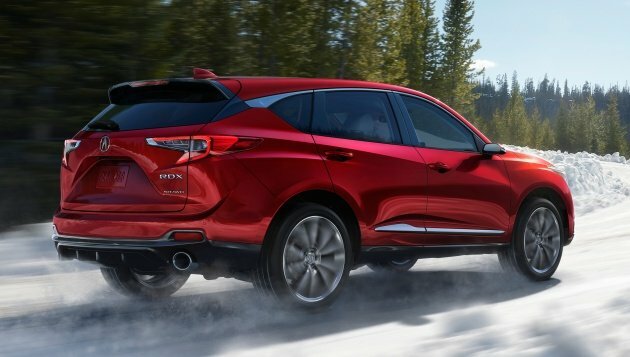 Acura Super-Handling All Wheel Drive (SH-AWD) torque-vectoring AWD returns to the RDX. 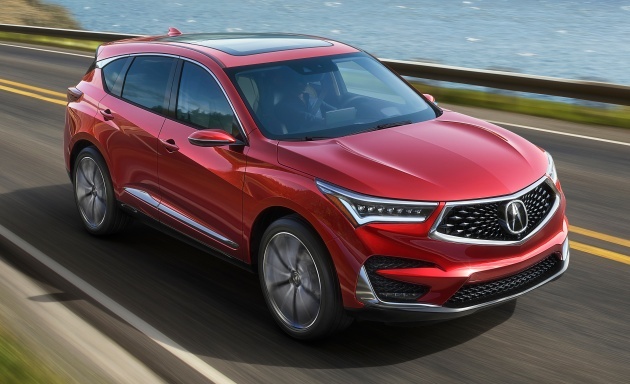 The latest SH-AWD features a newly developed rear differential with a 150% increase in maximum torque capacity relative to the outgoing RDX, making it the most advanced and capable torque-vectoring AWD system in the segment, Acura says. The available new Adaptive Damper System is tied into the NSX-inspired Integrated Dynamics System with four drive modes; Sport, Sport+, Comfort and Snow. Like the supercar, a drive mode dial is placed high in the center console. Speaking of the centre console, the 2019 Acura RDX also debuts a new Acura True Touchpad Interface, which the carmaker says combines the best elements of a touchscreen and remote interface. The Android-based operating system is projected onto a dual-zone, 10.2-inch display mounted high on the centre console close to the driver’s natural line of sight, with a head-up display available. How does this work? Now, touchscreens are easy to use, but are often a long stretch. A remote interface solves this problem, but the interaction between the remote and display is often clumsy. Unlike existing remote interfaces that operate like a computer mouse, every spot on the RDX’s touchpad is mapped precisely with the corresponding action on the centre display. For instance, a tap on the top left corner of the touchpad corresponds precisely with the action on the top left of the screen. Sounds cool. “Absolute positioning transforms the touchpad experience, making it personal, intuitive and particularly well-suited for premium, driver-centric, performance machines. It’s also designed to be adopted quickly and easily, as drivers become acclimated and comfortable in minutes,” said Ross Miller, senior engineer of user interface research. The RDX cabin – which uses materials such as Napa leather, brushed aluminum and open-pore Olive Ash wood – is larger than before thanks to a 64 mm longer wheelbase for class-leading cabin space, rear legroom and rear cargo space. The heated and ventilated front sport seats are in a new shape, supported by 16-way power adjustment for both driver and front passenger. All 2019 RDX models will come equipped with a new panoramic sliding moonroof that Acura says is the largest in its class. The RDX comes with four ultra-thin, ceiling-mounted speakers to add a new dimension of sound and fidelity to the audio experience. The 16-channel, 710-watt Acura ELS Studio 3D system was developed by Panasonic and tuned by Grammy-winning music producer and longtime Acura partner, Elliott Scheiner. The AcuraWatch suite of advanced safety and driver-assistive technologies is standard. Additional available connected-car and driver-assistive features include next-generation AcuraLink with 4G LTE WiFi, Hill Start Assist, Surround-View Camera System, front and rear parking sensors, Rear Cross Traffic Monitor and Blind Spot Information system. The 2019 RDX will be the first Acura SUV offered with an A-Spec trim, adding sport styling inside and out. The brand has announced that moving forward, all core Acura models will receive A-Spec treatment, as seen on the 2018 Acura TLX. can’t they rebadge dis as a honda sumthin2 , n sell’em ere…. Pls DRB, bring this glorified Honda in Malaysia and it will be compared to UMW Lexus & Tan Chong Infiniti. But I hear they also sold the Acura in Hong Kong, China, Russia, Kuwait & Ukarine. Very nice looking SUV inside and out. Dare I say, the interior looks better than the new NSX as well. And did i read that it says an exclusive Acura platform? Finally, no more platform sharing with Honda, yeay!! Lets hope this new touchpad interface is better to use on the move than Lexus’ finicky one. The ceiling mounted speakers sounds like a very good idea. Perhaps the pillars can ve used for carrying subwoofer level thump troughout the car as well. All in all, this is a very interesting SUV. Sadly, it will never come here. Hope I am wrong, and the powers-that-be allow Acura to come to South East Asia.